Butter cake is a must-learn cake for baking beginners, it is easy to make and is less likely to fail. 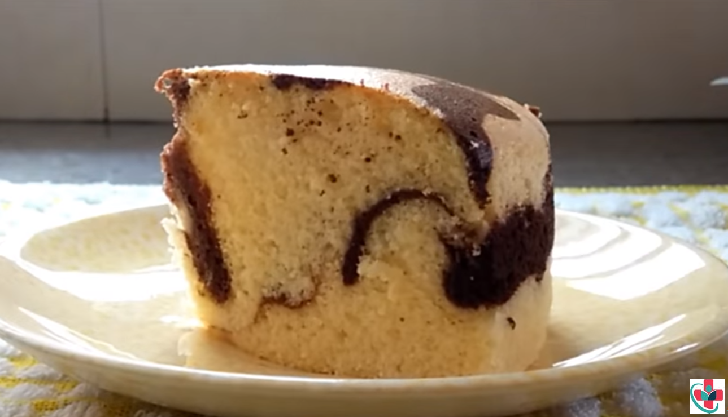 Marble butter cake is a combination of traditional butter cake and chocolate butter cake. It is a great cake with 2 flavors in 1, which can at the same time satisfy the taste buds of elders who like rich butter flavor, as well as children who prefer the rich chocolate flavor. Makes one 14 cm round cake, you use 2 x this amount to make one 20 cm round cake. Divide the batter into two, ³/₄ in one portion and the rest in another portion. Sieve cocoa powder over the smaller portion and fold to mix well. Pour batter into tin, alternating between the two mixtures, starting with the yellow batter and ending with the cocoa mixture. Tap the filled tin on kitchen top gently to eliminate any air bubbles. With a long skewer, swirl around the batter to create the marble effect. Bake for 40-55 mins or until a tester inserted into the middle of the cake come out clean.